East German Rain Camo Combat Pack with Clip-on Suspenders / Y Straps - Genuine Military Surplus; Troop Issue 1968-1991; Used / Excellent Condition - Heavy Duty Cotton Canvas - 12" x 5" x 11" | BUDK.com - Knives & Swords At The Lowest Prices! 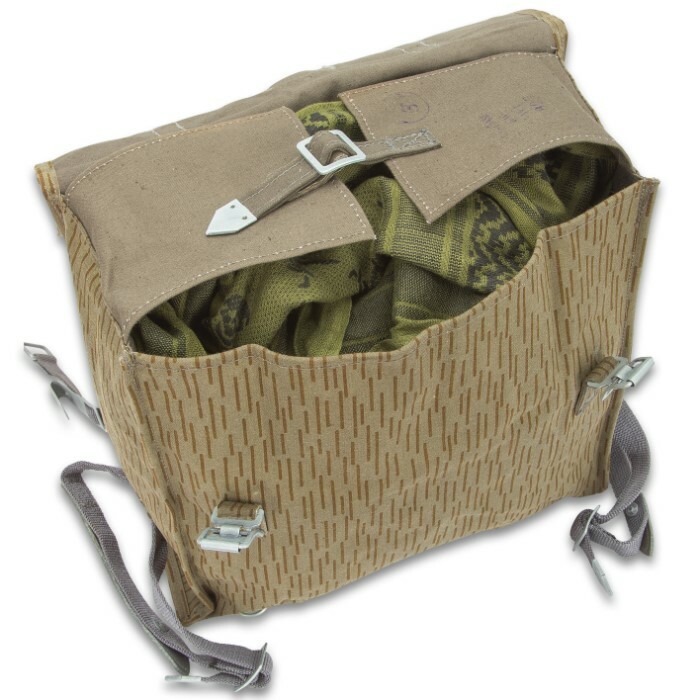 East German Rain Camo Combat Pack with Clip-on Suspenders / Y Straps - Genuine Military Surplus; Troop Issue 1968-1991; Used / Excellent Condition - Heavy Duty Cotton Canvas - 12" x 5" x 11"
Own a piece of military history and a versatile bag for transporting items varied and sundry! 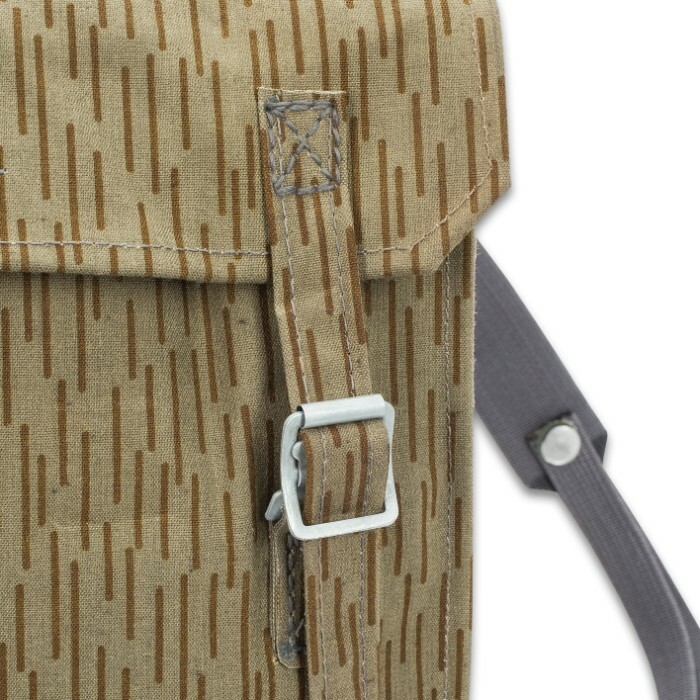 Perfect for collectors, outdoorsmen, businessmen, students and everyone else, the East German "Rain Camo" Combat Pack is the ultimate carry-all - far better than anything you'll find on racks or shelves at department stores or even high-end boutiques. It's genuine military surplus - issued to troops in the East German army from 1968 to 1991 for carrying food, drink and everyday necessities while in the field or on patrol. Despite their years military service, our combat packs are in superb condition! And that's no surprise, considering their weather-resistant cotton blend construction, metal hardware and sublime German engineering. The East German Combat Pack is exceedingly versatile, satisfying a wide range of transport needs. Built to withstand years of use in brutal combat conditions, it's perfect for carrying gear in challenging environments - on a hike in the woods, while camping in the remote wilderness and more. Despite its military toughness, the East German Combat Pack is remarkably easy to carry, with distinctive clip-on suspender straps for backpack-esque carriage. Boasting cool, vintage-chic style, it's as much at home in a posh urban nightclub or style-conscious office as it is on a vine-choked jungle trail. Regardless of where you take it, the unique Stricheldruckmuster or Ein Strich/Kein Strich, aka "rain camo" pattern is an instant standout. 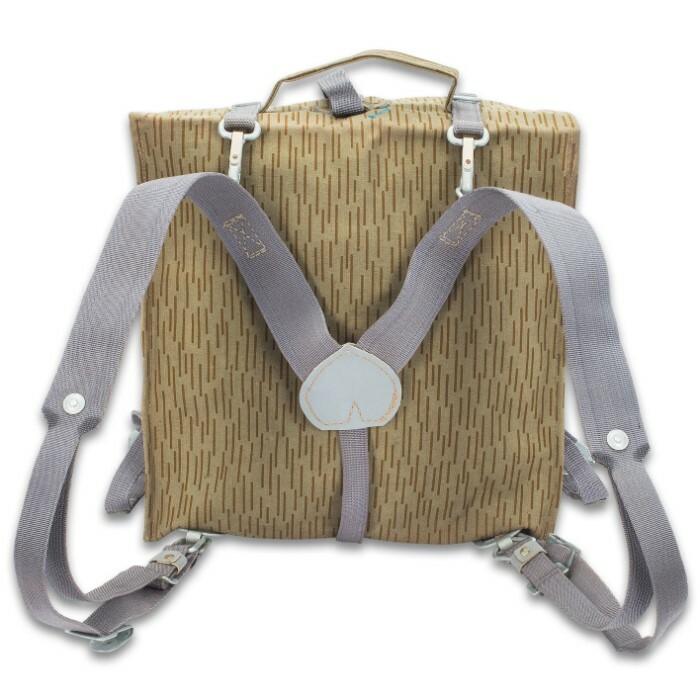 Multiple pockets allow for quick, easy access to gear on the go, and dual strap closures keep contents secure. 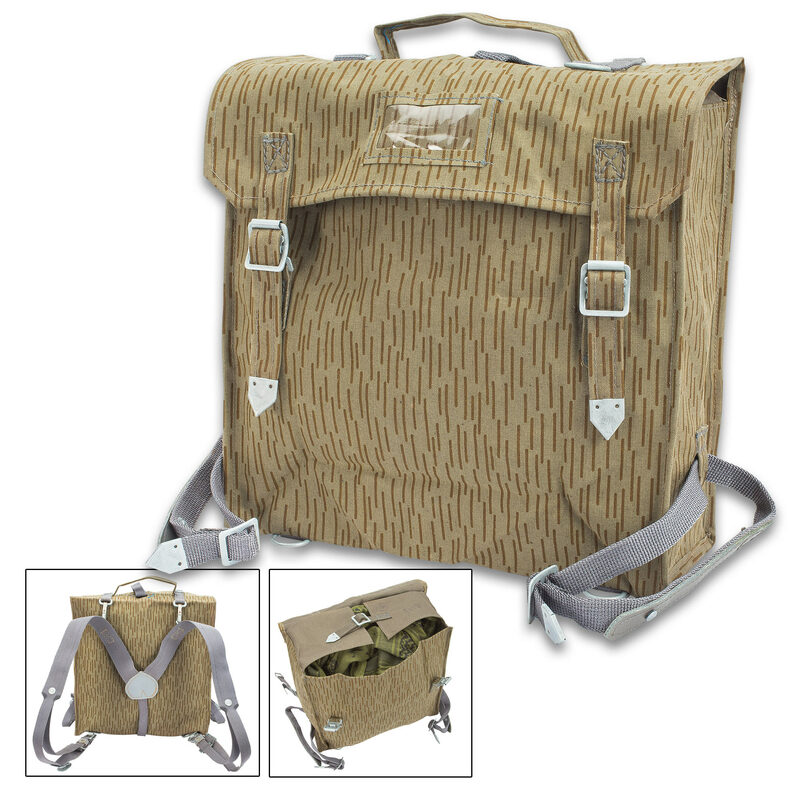 From lugging equipment in the field to ferrying textbooks across a college campus, the East German Rain Camo Combat Pack is your durable, fashionable, carrier-friendly solution! Why pay more for an inferior bag? Opt for military-grade quality at a budget-grade price! Supplies are limited, so order today!